On December 28, 2004 Thornhill elaborated: "Under the electric hypothesis Titan was likely born by electrical expulsion from the proto-Saturnian brown dwarf. So it should be found to have features in common with Venus, the planet that shows the most abundant signs of geologically recent ejection. Already it is known that Titan has the heaviest atmosphere after its sister, Venus." His further claims were based on the behavior of electrical discharges in such a dense atmosphere: "Titan’s surface features should also be compared to those of Venus. Scientists tell us that Titan seems to have been "resurfaced" because there is no evidence of the expected primordial cratering. The same thing was said about Venus! Also a radar return from Titan was 'of a type that we would expect to get back from Venus.' In the electrical hypothesis, the similarity would be expected--a heavy atmosphere tends to cause filamentation of cosmic electrical scars instead of large craters. Such scars encircle Venus’s equator in the form of rilles and spider-web-like formations called 'arachnoids'." These claims should be easy to falsify. But so far the electrical model is the only one to successfully predict what would be found by the Huygens probe. On today's TPOD we look at features imaged by the Huygens probe in its successful descent to the surface of Titan and compare them with images of Venus. At top left we see a radar image of the Venusian surface returned by the Magellan Orbiter. David Grinspoon, in his book, Venus Revealed, interpreted the dark areas in traditional "geocentric" terms: "The vast volcanic plains that cover nearly all low-lying areas are the long-sought global ‘oceans’ on the surface of Venus – frozen oceans of basalt. One of the most astounding surface forms discovered by Magellan furthers the analogy: this ocean is fed by rivers! We see numerous thin, meandering channels, typically a mile wide and up to thousands of miles in length. [The small inset to the Magellan image shows an example of the 'river' channels cut into the white areas.] On Earth or Mars we would interpret such features as evidence of past or present running water. The analogy goes quite deep.... We have had to use a lot of imaginative physics and chemistry to come up with a suitable model." 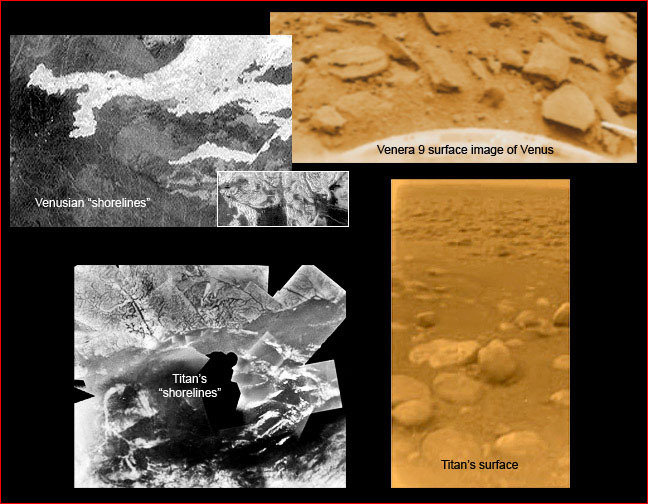 Now similar features are being discovered on Titan [lower left image]. Traditional interpretations will again require "a lot of imaginative physics and chemistry." But the electrical scarring model applies simply to them all. The surface of Venus can be matched against the surface of Titan, feature for feature. The Huygens probe is believed to have come to rest in the dark area, or "sea," at the center of yesterday’s TPOD image. The surface of the "sea" is solid! At bottom right is the first image returned from Titan’s surface. For comparison, above it is an image of the Venusian surface returned by the Russian Venera 9 spacecraft. David Grinspoon again, referring to Venus: “The immediate impression, of an eroded field of volcanic rocks, has stood up under decades of scrutiny.... What would erode and transport fine-grained material on a planet with no water and almost no winds?” Emily Lakdawalla, The Planetary Society's Science and Technology Coordinator, had a similar “immediate impression” of the “eroded field” that Huygens imaged from the surface of Titan [lower right image]: "Any geologist worth her salt thinks of one thing and one thing only when she sees round rocks: some river of some liquid has rolled broken chunks around, wearing down their edges, making rounded cobbles. Or, as United States Geological Survey geologist Larry Soderblom remarked to me: 'We've got rolling stones!'" But there is another mechanism that creates strewn fields of eroded rocks on a vast scale. The process of planetary birth and subsequent electrical interactions during close encounters with other bodies, as orbits adapt to a new stable configuration, causes deposition of dust, stones and boulders arriving from space or blasted from distant parts of the same body. Plasma heating and etching, combined with "spark" generated "winds," are responsible for rounding the rocks, scattering them uniformly across the landscape, and leaving "flow streaks" from electrical "winds." The traditional erosional mechanisms of blowing gases and flowing liquids require action over long spans of time to achieve observed effects. Electrical erosion, resulting from the action of forces that can be billions of times stronger than mechanical forces, can achieve observed effects in short times. Similarity of features is not proof of identity of cause. Further empirical tests must be devised to distinguish among possible hypotheses. But this first test--the Huygens close-up observation of features--verifies the predictions of the electrical hypothesis and surprises, if not falsifies, traditional explanations.